Read Honest and unbiased review of Popular Children’s book – Room on the Broom by Julia Donaldson from a mom. Frequently asked questions like What is the story about, what does it teach, will we recommend it to other answered in Room on the Broom book review below. Julia Donaldson’s books are known for funny characters, rhyming sentences and interesting story lines and they are always loved by kids and adults. The book “Room on the Broom” is a classic book with funny situations and wonderful characters. Do you know about an animated short film, based on the book “Room on the Broom” was nominated for Best Animated Short Film for 2014 Academy Awards? 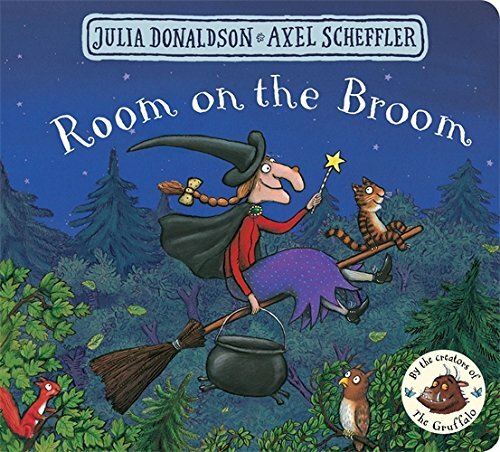 Room on the Broom is a humorous classical well known book by Julia Donaldson. What does it teach ? Is it slow fast ? How are the illustrations ? Will you recommend it to others ? Will you read it again ? The book starts with a witch and a cat, flying on a broomstick going over the fields, rivers and the mountains. As the wild wind blew, it blew off the hat, bow and wand of a witch, and all these objects were found by a dog, bird and a frog. And all these founders were keen to ride on a broomstick. The kind witch said “yes” to everyone and they all were happily moving around in the sky when due to the more no of riders, the broomstick snapped in two. After that witch was in danger and her companions saved her life from a dragon. So how they did it and what happened next? I must say, the end of the story is really beautiful and thoughtful. So friends, grab your copy and read the book with your kid. I am sure you will fall in love with the book. Me and my kid, we both are a great fan of Julia Donaldson’s books. This is our second book from Julia Donaldson and we love it to its core. It’s a great book with rhyming words and catchy illustrations, which keep the kids occupied and entertained and they love to listen the story with a great interest. I am happy that I introduced this book to my kid, who loves to go through the book at least twice in a day. I bought this book because I have heard really good reviews about the book and now I am here sharing my reviews with you all. The book is about a kind witch who started her journey with a cat. On her way due to stormy wind she lost her few things which were retrieved by some creatures. Each time she lost an object she gained a companion who found her objects on her broomstick. The story moves with rhyming statements and wonderful illustrations and takes the reader to its well thought end. As I explained before, the story is about a kind witch who allows other creatures to have a ride on a broomstick because they retrieved her lost things. So she showed her gratitude towards them by allowing them to sit on a broomstick. On her journey she made friends which saved her life when she was in danger. So in short, I can say the book teaches us to be kind and have some really good friends. Do good to everyone as much as you can, because good friends are like a lifeline and they can help you when you will be in need. Second thing, unity has strength. Her friends when joined their hands together were able to save her life. Thus, book has a great message conveyed in a funny way. The book has a good flow. It keeps the reader and listener interested and they tend to be keen what will happen next in the story. The illustrations are really cute and amazing. Book’s colourful illustrations can grab the attention of kids and can keep the kids interested in book reading. Illustrations are well in-line with the conversation and statements, thus kids love to look at them and can understand the story well. Yes, I love this book and will recommend it to others. Its a wonderfully written book, a must buy. This is our current favourite and will be, I think. We love to read it daily. A must read for three year olds and above ! Did you find this children’s book “Room on the Broom” review useful ? Do you want to add anything the book review? Let us know using comments below. We would love to hear from you.